My boyfriend lives in Bishops Waltham (a little village about 10 minutes away from me in Hedge End) and every so often the Hampshire Farmers Market travels to BW to set up camp in the village square for a few hours on a Sunday. We always try and take a trip down to check out the market which always has a wide range of fresh and seasonal local produce. One Sunday in the summer we were quite taken with a stall that sold watercress burgers, falafal and sausages and once we’d tried a few samples we stocked up on their delicious produce! 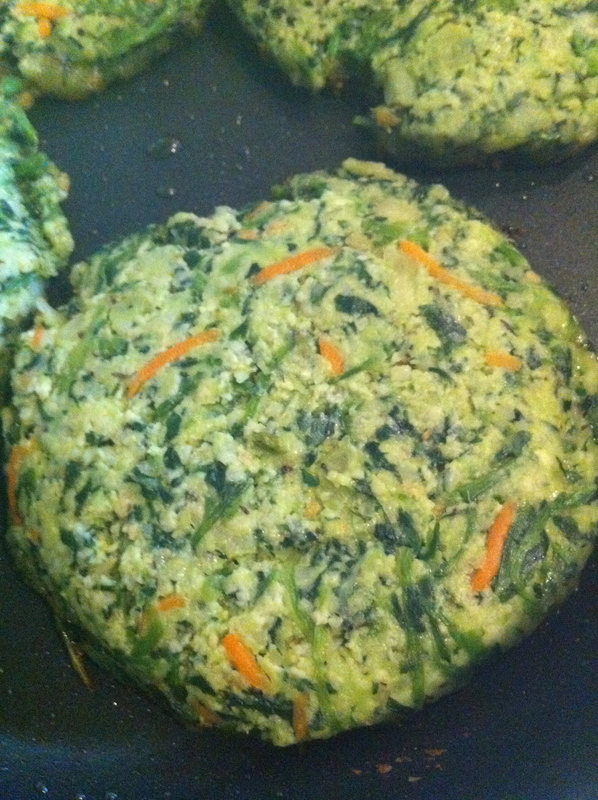 My boyfriend bought the watercress sausages and a pasty and I bought a couple of watercress and cheese scones. We toasted the scones and ate them for lunch with butter and they were amazing. Unfortunately, the sausages were only in date a couple more days after the market and we just didn’t get time to eat them so we had to throw them away! A very dark day indeed. However, a couple of weeks ago we were buying some groceries in the Bishops Waltham Co-Op and we stumbled upon a selection of aforementioned watercress goods in the fridge! 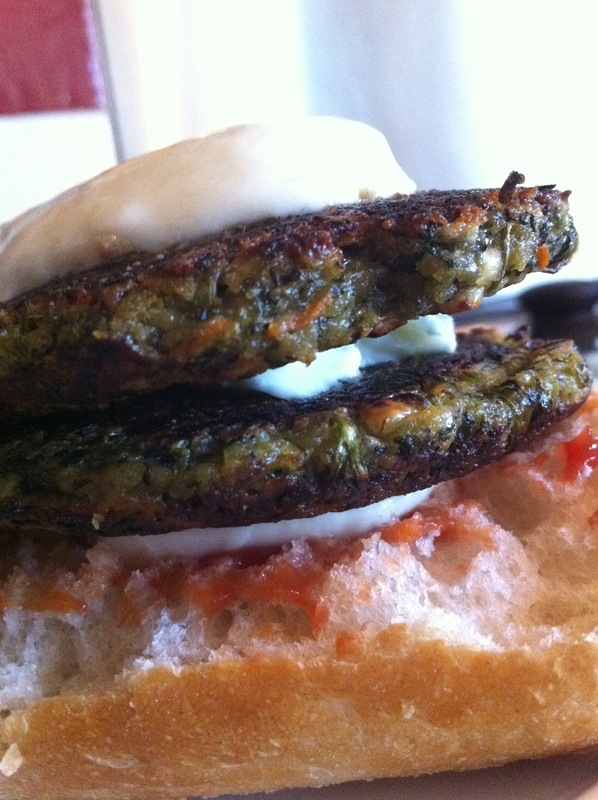 We bought a pack of four watercress burgers and more or less sprinted back home to try them. Once we got back, I studied the packaging as Ben heated some oil in a pan. The company is called Cresson Creative and they have a lovely little website detailing the story of the company and how they started. 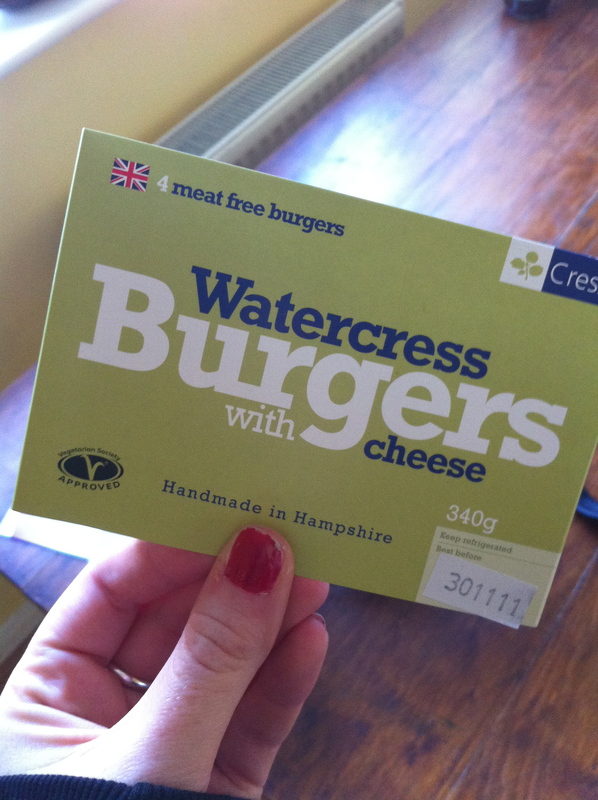 I was excited to learn that the watercress used in all their products is grown in Alresford, a few miles away from us near Winchester! Doesn’t get much more local than that! They are Vegetarian Society approved and the ingredients form a motley crew of watercress, cheese, onions, garlic and mustard and some breadcrumbs to bind them together. We were pretty hungry so I am ashamed to say we cooked all four at once! While Ben pan-fried the burgers I toasted some ciabatta bread and sliced the ball of mozzarella we had bought (there really was no need for added mozzarella with burgers that are mainly cheese but we couldn’t resist!) 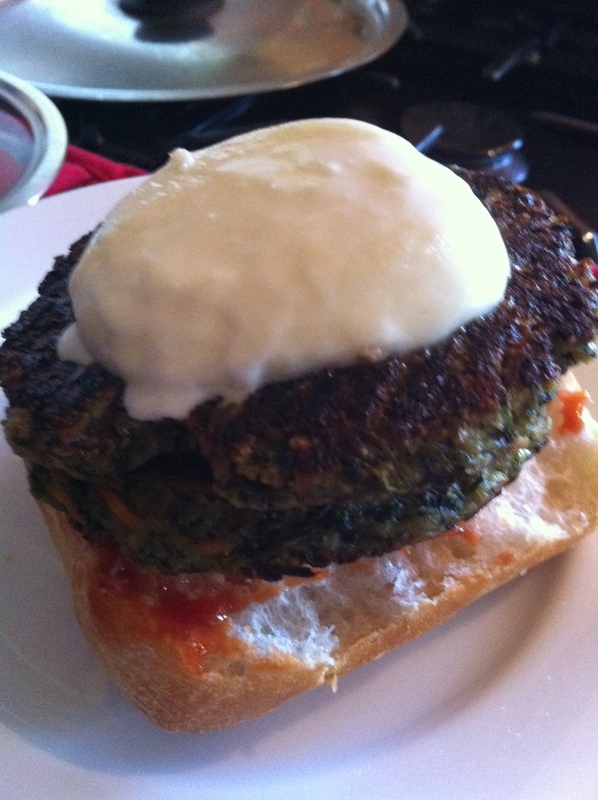 The burgers crisped up really nicely on the outside and stayed soft and gooey on the inside – perfect! 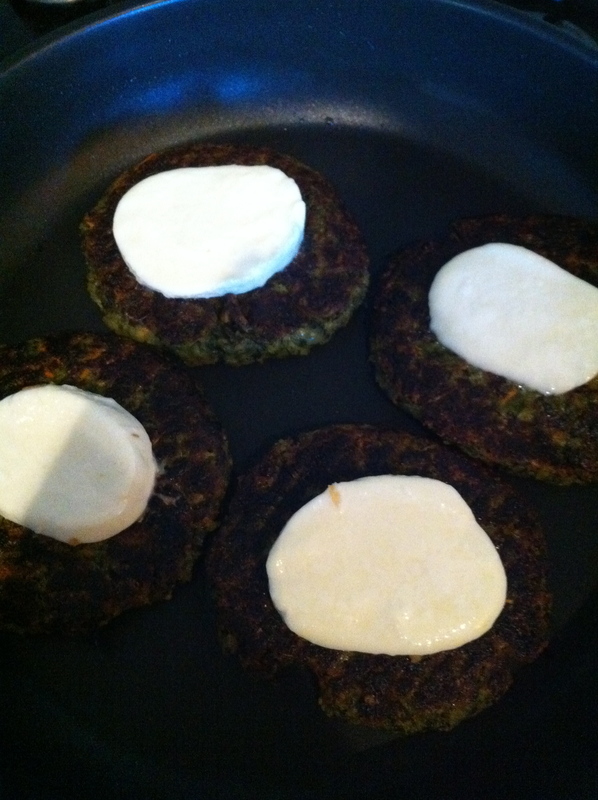 Ben had the genius idea of laying the sliced mozzarella on the burgers as they cooked, causing the milky cheese to melt slightly and adhere to the top of the burger. Once they were cooked to our liking (an abundance of burnt crispy bits on the edges!) we piled them on our ciabatta with a splodge of Heinz ketchup and jammed the lid of the roll on top. No side accompaniments were needed, this was a very humble lunch. 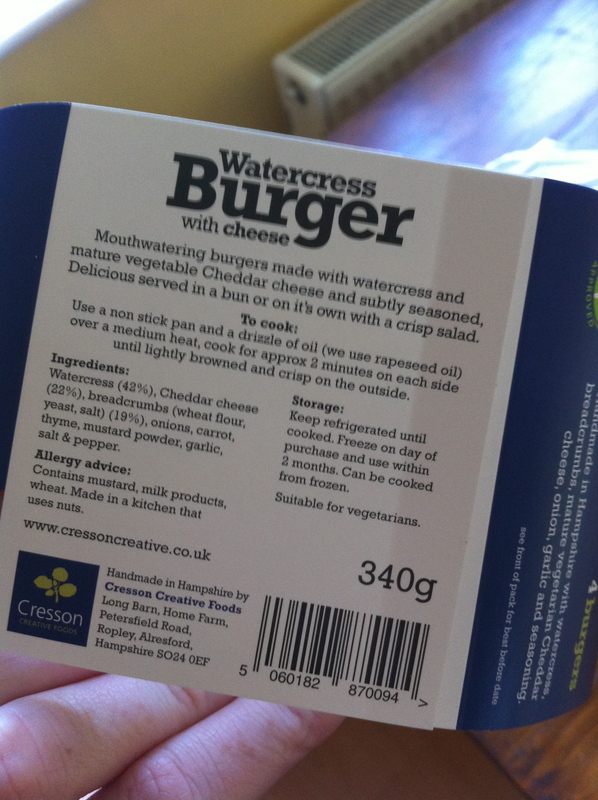 The watercress burgers were delicious with a really unusual flavour that I hadn’t come across before. Obviously the addition of cheese in the mixture was an excellent idea and our greedy mozzarella topping only enhanced this. 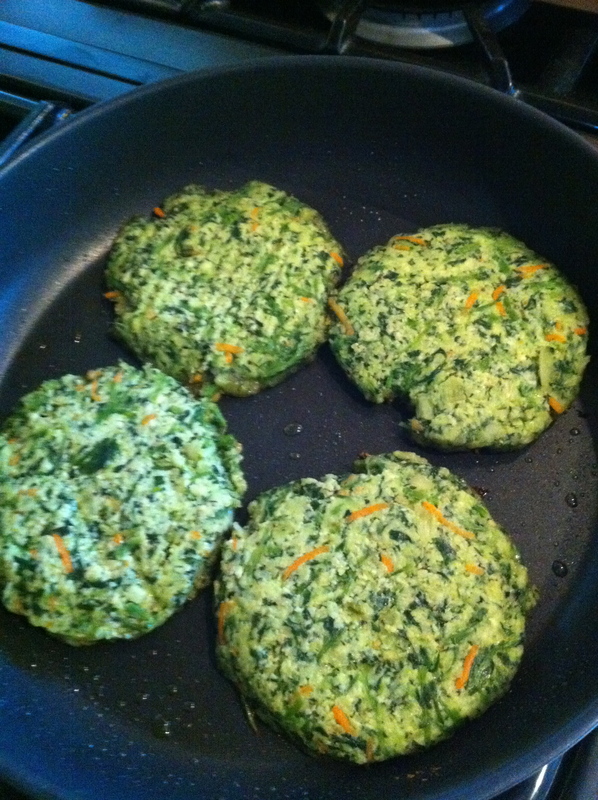 These would be an excellent replacement for the tired-looking Quorn or spicy bean burgers usually faced by vegetarians in the summer months and generally make a nice change from beef burgers. Delicious!